Note: Shuttles will run from 9:00 a.m. to 9:00 p.m.
8:30 a.m. – 10:00 a.m. “In the Footsteps of History: the March to Malvern Hill” – Union and Confederate soldiers recreate the march between the two great battlefields. March departs from Glendale Visitor Center and ends at the Parsonage. 5:30 p.m. – 6:30 p.m.“’It was not war — it was murder’ – Southern Valor vs. Union Firepower” – NPS Ranger-led walking tours that follow in the footsteps of the attacking Confederates. Meet at the Confederate artillery position to follow Gen. Magruder’s attack; meet at the Parsonage to follow Gen. D.H. Hill’s. As the two groups converge, experience the challenge of coordinating these assaults. 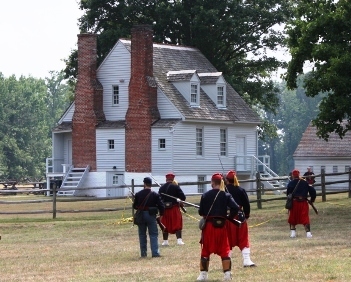 Living history demonstrations, ranger-guided tours, and commemorative programs highlight this interactive weekend event commemorating the 150th anniversary of the Battle of Gaines’ Mill this Saturday and Sunday, June 23 & 24. Ongoing all weekend 9:00 a.m. to 5:00 p.m.
My dad is leading our family on a tour of the Seven Days Battle this Saturday, following the movements of one of our ancestor’s regiments, so I expect a stop at Gaines Mill will be on my agenda! Save a spot on your calendar next Saturday, April 14, for the Third Annual Civil War and Emancipation Day. 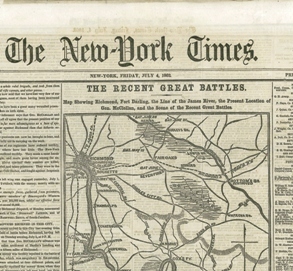 As the country commemorates the 150th anniversaries of the Civil War and Emancipation, Americans are looking for opportunities to learn about the conflict that divided our nation. On April 14, The Future of Richmond’s Past will host the third annual Civil War and Emancipation Day, a day of special events with free entry into nearly 30 local sites and attractions, and free shuttle bus transportation between the sites from 10 a.m. to 5 p.m. From discussions with leading Civil War scholars to guided tours of historic Richmond sites, cannon firings to children’s games, song and dance performances to canal boat rides, Civil War & Emancipation Day provides a wonderful opportunity to explore Confederate, Union and African-American history as well as history about life on the home front during the war. Additional activities include a marketplace, special exhibits, and mingling with historic interpreters. Guests will have the opportunity to visit attractions such as the Virginia Capitol, Museum of the Confederacy and White House of the Confederacy, Black History Museum and Cultural Center of Virginia, Valentine Richmond History Center, and American Civil War Center at Historic Tredegar, the first museum in the U.S. to explore the war through three interwoven perspectives: Union, Confederate and African-American. Guided tours of the Richmond Slave Trail will be available. More information about the day’s events and participating organizations can be found at civilwar.emancipationday.net. A grid listing the full schedule of activities can be found here.